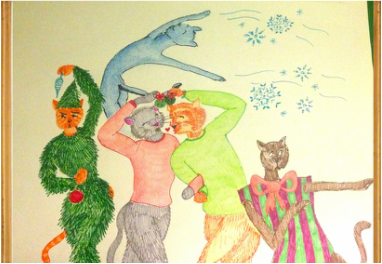 What: It's the J. Lindsay Brown Dance Twelve Days of (pre) Christmas Fundraiser! Normal fundraisers weren't exciting enough, so we at J. Lindsay Brown Dance bring you twelve days of holiday excitement. That's right: 12 for the price of none! When: From December 12-24, we will release a new surprise each day. There will be movement greeting cards, mini-dances, artwork, singalongs, and much, much more! You don't need to spend a single penny to enjoy our daily surprises, but we hope you consider finishing up some of your holiday shopping with one of our sponsors. Where: You can find these surprises here on the website, on our Facebook, or have them delivered in large chunks to your inbox. This seems random: Is it? We hadn't noticed. By Rachel Kowalczyk​. Click the cats to see the whole thing!